Whew...I finally finished these chairs! I picked two of these frenchy chairs up at the thrift store clear back in December for $20 each, but it took me this long to get both of them re-upholstered. I quickly dove into working on one chair and completed it last winter, but then many of my home projects got pushed aside for finding and re-finishing pieces for the Luckett's Spring Market last May. To be honest, the first chair that I completed last winter was the first real re-upholstering job I've done. Yes, I've recovered simple chairs and a bazillion dining chair set covers over the past several years, but I usually stuck to wood pieces to re-finish. It didn't take much to convince myself that I needed to just give upholstery a shot...just call for a quote for re-upholstering a standard chair...not in my budget! It's a bit of a challenge when you're first learning...lots of pulling and tugging. I've done several chairs since last winter and I'm slowly getting better at the corners, etc. Someday, I'd love to take a real upholstery class. I would recommend one thing to a new upholsterer...don't use velvet (or striped fabric) for first time projects! I thought I was being clever by purchasing two $15 clearance brown velvet curtain panels at Target to save a bundle on fabric costs, but it was really difficult to work with and velvet shows everything. In total I spent around $100 for the pair of chairs because I also had to replace the foam seats, but I'm glad I was able to find something I could customize for my home and give me some upholstery experience at the same time. The chairs are far from perfect, but I learned a so much from the process! They look fantastic! I have never thought of using drape panels! Genius!! Beautiful, Kristen! I just love the fabrics! WOW! that chocolate velvet is divine! These are so beautiful! I know you said the velvet wasn't easy to work with but it's my favorite part. It looks so rich and luxe. I think you did an amazing job! Can I feature these tomorrow on my blog? I'll link to your page! very nice job! Now can you come and do mine? You did a fantastic job Kristen! They look great in your bedroom! Great transformation! Love them. I'd love for you to share this at my linky party, Twirl & Take a Bow at www.houseontheway.com. I hope you can stop by and join in! Love the brown fabric you chose! These chairs look incredible...what a great job! Come link up to Centerpiece Wednesday on my blog and share this idea and enter my giveaway. Kristen this is a great post, I love these chairs! I want to attempt the faux fireplace. Kristen...the chairs are fabulous!! !...I am with ya..I would love to take an upholstery class!...however, not sure you need to as you did such a terrific job on these chairs.! !....I love the fabric and they look so very sophisticated...Bravo..great, great job! You've done a wonderful job, Kristen. they look so professional! love the brown velvet with that gorgeous print. Fabulous and love the fabric choices. The chairs are gorgeous! Thank you for sharing your project at Potpourri Friday! What a great find! You did a great job. Beautiful chairs with such great lines. I love the choice of velvet. Nice work! These chairs turned out great Kristen. You'd never ever know that they weren't done by a professional upholster! Those chairs are gorgeous. Beautiful. They look pretty perfect to me :). I love your fireplace too. They turned out beautiful! Great advise too. My first job was on wing chairs, and although people told me that is the most difficult to start with, I learned so much that future projects were that much easier. GREAT WORK!! Would love if you stopped by my party happening now to link it up! Beautiful! I'm in awe of you guys doing upholstery. You are featured today at Potpourri Friday at 2805! Yes, twice in one day! So lovely, I've been looking for a chair like that, and you did such a wonderful job especially given it was a first time re-upholstery! That faux fireplace is so clever and definitely brings a layer of warmth (hehe) to your room. Lucky you with such a talent step-dad. I have a fireplace in our living area that we never use and I wonder if I could pull off a drawing like that to use for fall / winter. Thanks for the inspiration! Those chairs look amazing! I love the big boxy look of the chair pads, and from the photos, I cannot see anything wrong with the velvet. What a cool choice! For your first big upholstery job, I think they look like a pro took them on. Thank you for sharing! PS I would love it if you had time to link to my party, I would love to share these chairs with my readers. Closes tomorrow night at midnight. thanks, -K! Love your chairs! Thanks for showing a little of what it looked like on the inside. I have a chair I have had for a year waiting to re-do. I'm nervous! I got some gorgeous burn out velvet (I think thats what it is called) it has a pattern--hopefully it will be forgiving. Any suggestions? I just need to say, I'm impressed! 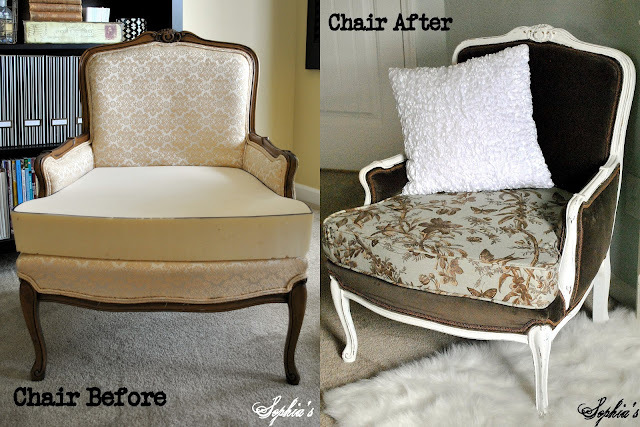 To tackle the job of reupholstering goes well beyond being crafty and there may be quirks but kudos to you! And as difficult as velvet may be I still love the fabric selection.